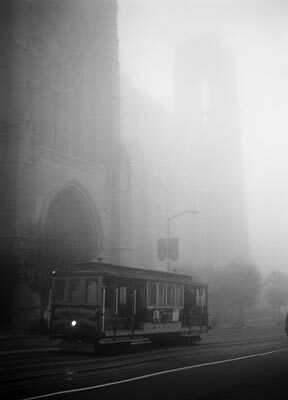 Late last year we had a few very foggy days here in San Francisco and on that specific morning the fog sat like a fluffy pillow on top of Nob Hill. It was eerily quiet with almost no cars on California Street and while I stopped to take a picture of Grace Cathedral an empty Cable Car rattled into the scene like a ghost from another time. Taken with my Kodak Duo Six-20 on Ilford Delta 100. Click for a large version.